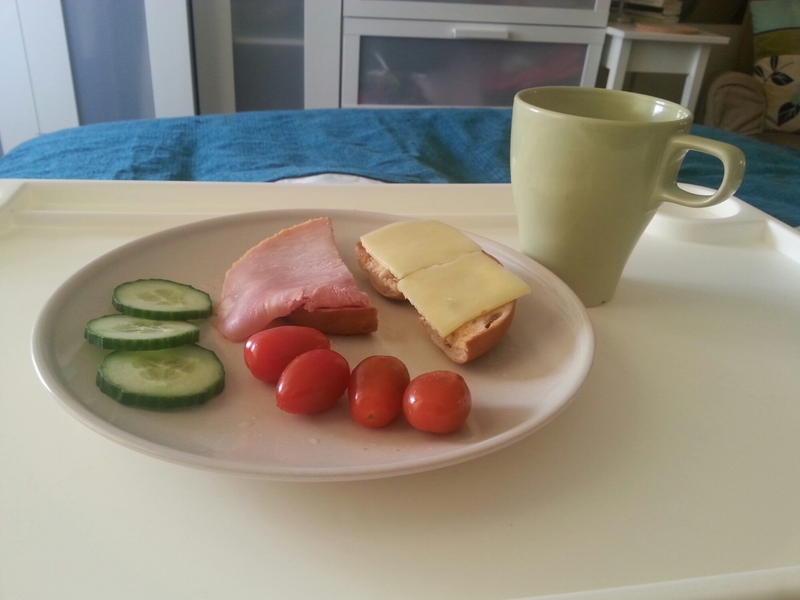 Grateful for – Bagels with cheese and ham, with some cucumber and baby tomatoes. Made by my husband. Had this for breakfast this morning. And really really enjoyed them, especially as I’d eaten nothing since yesterday afternoon. Was starving . . . ! Reason for this was bad headaches resulted in me getting into bed early evening. With painkillers. And the plan (ie. hope) that a couple of hours lying down, comfy with eye patches on would do the trick. But I was feeling exhausted after just printing 6 emails off in the afternoon. I find it too hard to read things some days unless its in print form. But just looking at the laptop screen for too long, plus the noisy printer triggered off the dammed headaches. Anyway I ended having to stay in bed right thru to this morning. Hence no dinner last night. But don’t want to dwell on that. He always makes them the night before while making his lunch rolls for work. He has been doing this for so long now he kindof does it on autopilot. And I’m very grateful for it . . . The frustration of this condition knows no bounds, and I guess I just need to write about it today. Last Sunday I got out with my husband during the day. Our car is fixed now and it was so good to get out. I think it was the first time I have been out during the day (ie, in daylight) for maybe 8 weeks. I suspected I’d be paying for it a bit the next day – especially after climbing all the stairs to get back into our top-floor flat once home. But that would have been ok. Well not ok exactly, but I would have accepted it without feeling too stressed about it. I’m writing this on Friday morning and have been pretty much bed bound for the last 4 days. Not so much with exhaustion and weakness (although that too). But with crippling headaches (again). So frustrating after managing a few hours out on Sunday. That horrible reality of 1 step forward then 3 steps back. It all got triggered by an argument on Monday evening with husband. Won’t go into details, but it was an issue that’s been argued over many times. For me, very upsetting. And it always feels unresolved. Hey ho . . . but that’s married life isn’t it ? But it made me think about how emotional exertion (from a bad event) can sometimes have an even worse impact on this condition than doing too much physically. At times. If that makes sense ? Well it made sense to me. Being in bed for 4 days completely disabled by headaches and exhaustion is bad. Oh god, these headaches are vicious. Been using the usual stuff like Panadol Extra together with Ibuprofen – didn’t work. Eventually gave in and resorted to taking Solpadeine Max the last two days – which I really don’t like taking because of the addictive affect of the codeine in it. And you are only allowed to use it for a maximum of 3 days anyway. Also tried using cool gel migraine patches on my forehead. Some things would take ages to work, or not do anything at all. 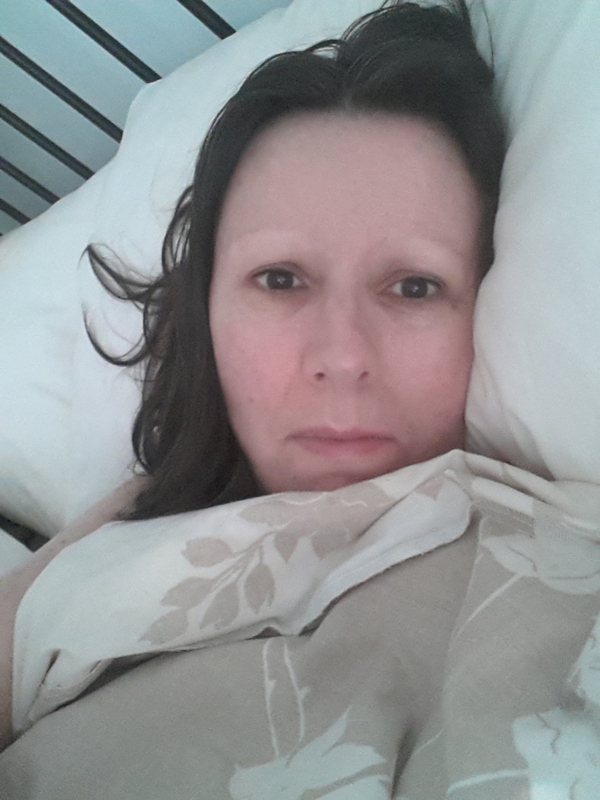 Lying in bed with so much pain was driving me mad, but I didn’t have the strength to get up and move around. Or do anything to distract myself from the pain. All I could do most of the time was try to “go with the pain” and breathe. As slowly and deeply as I could. Over and over. Most of the time this didn’t work. And I have to confess I wasn’t thinking calm or relaxed thoughts . . . This is the UK with a proper health-service. Not some backwater country with no health service. It’s ridiculous that I can’t get any help with some decent pain medication. Its really not much to ask for. I’ve been mentioning these headaches to GP for years and years. And at least twice to docs at the Homeopathic Hospital. But nobody listens to a word I say. And the last GP who phoned me from the surgery I have been with for 28 years was awful and actually made things even worse. And it is so bloody hard to change docs. To physically do it I mean. With this condition. This is a situation I’m really struggling with. And have done for years. So far, I have managed to get a registration form from another surgery. But my husband had to go in to collect for me. As they don’t post or email them out regardless of your situation. The receptionist I spoke to didn’t seem to understand much about the limitations of ME/Cfs. And it will be impossible for me to actually speak to the GP until I am registered as a patient. 1) You have an appointment/examination with the nurse and fill in the form (I’ll need to complete it in advance). 2) Then (IF they agree to accept you as a new patient) your medical records get transferred. I was informed this can take 2 months. I have no idea why that long. 3) Once this has all happened you can actually speak to the GP – if he hasn’t retired by that time . . .
4) You you have to hope (and pray) that he has some knowledge of ME. And even more importantly – a decent attitude towards it. So its a kind of catch 22. You have to go thru this process first, before you find out if it was worth all the effort of doing it (ie, to get a decent GP). You may be rejected anyway. You may complete the process then find out the GP and the surgery are even worse than the old one. The chances of getting a GP who is more “ME/CFS friendly” and informed is maybe 50 – 50. Even that may be optimistic. After just one phone conversation with the receptionist, I was exhausted. Mentally and physically. And frustrated that she couldn’t understand why this is a difficult process for folk with ME/Cfs. And may be pointless for me, and a waste of their time also. I tried and tried to explain why it was difficult. But the longer I tried the more exhausted I got. And of course, the brain fog always gets worse in these situations. And I probably just started to sound drunk and confused. I really need to be a lot more well than I am just now, to be able to do this. When I was more well in the past – that of course is when I should have put all my energy into doing it. But I will really need to persevere with this now. I have doubts about the surgery for a few reasons – parking issues, suspect it may be quite a noisy surgery, etc. When my husband collected the registration form he said it looked as though it was “full of Romanians and asylum seekers” . . .
All I could think of was – as long as they’re not noisy I don’t care. But the GP has been mentioned to me. And I simply don’t have the energy to phone around various places. It would just be the same process everywhere from what I understand. At one point this week, I was actually trawling the internet for websites that sell you painkillers that normally require a prescription. But without a prescription. They seemed to be mainly American sites. But I couldn’t go any further with that – mainly because I just couldn’t tolerate looking at the tablet’s screen for long enough. And couldn’t concentrate enough to be able to read or digest the information. However that was maybe a good thing. As this would seem a rather dodgy thing to do – maybe even dangerous. But the pain was bad. Today however, it is much less. And I’m writing again – even if it is a bit negative. I will try and do some lighthearted posts, I promise. The Real Face of CFS . . .
OK, here are 4 photos. I think I am being quite brave putting these on. Especially as photo 3 is awful ! Photo 3 : A Bad Day. 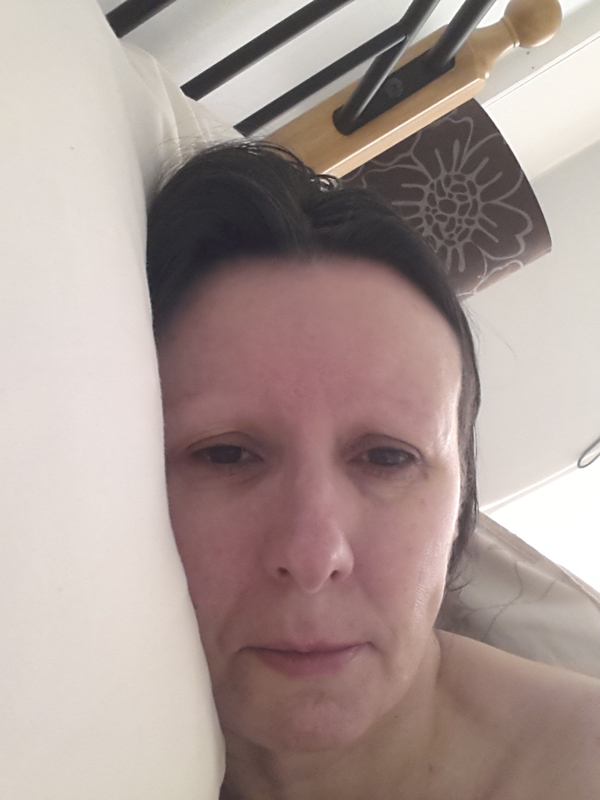 In bed, exhausted, in lots of pain (head, eyes, neck, shoulders). Unable to function. Photo 4 : The same Bad Day, but the pain starting to ease off. Maybe 5 hours later. When people see me – I am maybe like photos 1 or 2. But for most of the time, people don’t see me. And this is very typical of people with CFS or ME. This year, I have probably looked like photo 3 for a huge amount of the time – maybe 75% of the time. In bed, exhausted, in pain, not functioning in any way. It has been one of the worst years I can remember in all my years with CFS. But I think I’m starting to improve slightly now. Very very slowly – baby steps. I’m almost scared to say this – incase its tempting fate. If that makes sense ? I wanted to publish these photos – as Photo 3 is the “real face of CFS”. I’m sure there people out there who still assume Chronic Fatigue Syndrome just means that we get a bit tired. And get tired more often than average. And therefore they regard it as not very serious. But (unfortunately) there is much more to it – as you can see from this list. 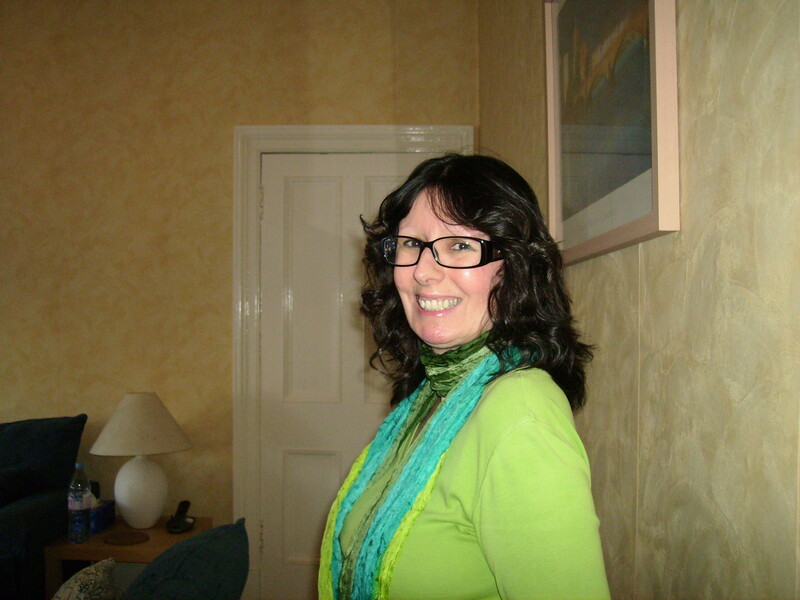 It is rather a long list – and I realise that I have some symptoms now that I didn’t have eg. 6 years ago. I feel that the longer you have CFS and/or the longer you had to go before getting diagnosed – the more it may become “entrenched” or “ingrained” in you. And all the harder to get rid of. NB. This is just my personal opinion and not based on any medical facts. 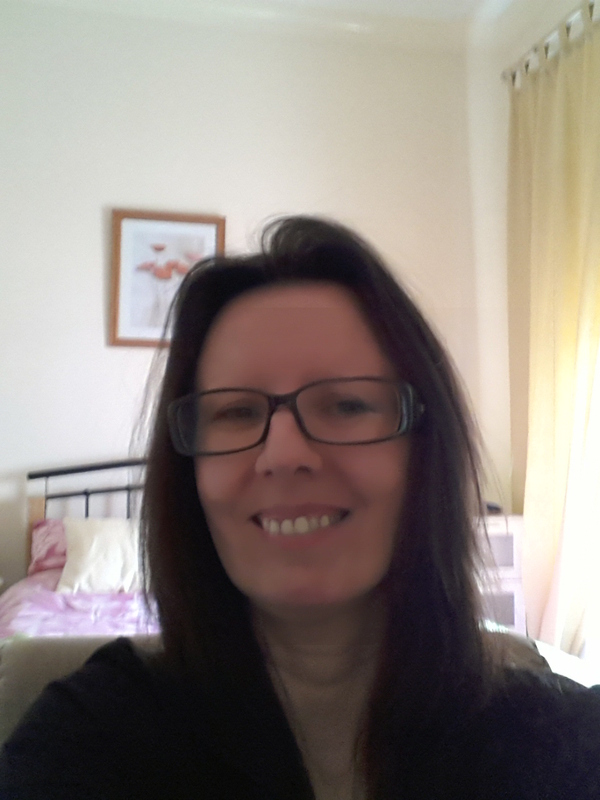 But I also know I am very lucky in that my symptoms do fluctuate and I am not hit anything as badly as some who are classed as having severe CFS or very severe CFS. Or severe ME & very severe ME.